I can't believe it's been almost 3 weeks since my last post. It has definitely been busy though. We had a trip to Seattle to watch my brother get married, and I still am not sure I've fully recovered from the craziness! It's a good thing school starts a week from tomorrow. Maybe things will start to slow down again! While I was gone I put together this mini kit for the Week 4 challenge. The challenge was to use a shape on all the elements and patterned papers. I was in a celebratory mood, so I used balloons! I think this turned out pretty fun, and have a few new favorite pieces in this kit. See that little brad in the middle of the flower? I learned how to make glitter, and used it there. My other favorite piece of this kit is the alpha. I love the little bitty balloons that follow the shape of each letter. Thanks so much for stopping by! I'll be taking part in a blog train on Thursday with my kit from week 5. I have all the elements done (that was the week 5 challenge) and just have to put together a few papers today to round it out. See you then! I downloaded this from your blog. 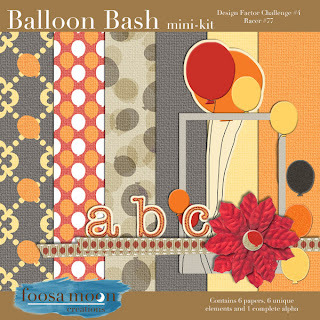 I don't know how I missed it in the Design Factor Challenge Gallery; it is gorgeous.